REFERENCES: Blümner, 67-89, 533-589; Sandys, Companion, 66-84, 211-217; Daremberg-Saglio, under rūstica rēs, vīlla, hortus; Smith, Walters, Harper’s, under agricultūra, hortus, vīlla; Pauly-Wissowa, under Ackerbau, Gartenbau, Gemüsebau, Getreide; Cagnat-Chapot, II, 295-308; Friedländer, II, 193-202; Mau-Kelsey, 355-366; Jones, 170-184, 304-315; Showerman, 251-266. See, also, Heitland, 131-335; Frank, An Economic History, 1-15, 55-68, 96-107, 219-274; Rostovtzeff, 180-194; “The Crooked Plow,” by Fairfax Harrison, The Classical Journal, 11 (1916), 323-332; Roman Farm Management; Tanzer. 429. In addition to casual references in literature our sources of information about Roman farming include treatises on the subject by the Elder Cato, who wrote in the second century B.C., Varro and Vergil, at the beginning of our era, Columella and Pliny the Elder in the first century A.D., and Palladius in the fourth. Works of art occasionally show something of the implements used. Excavations have brought to light remains of villas in different parts of the Roman world, and occasionally metal parts of implements have been found. 430. Agriculture was the industry of early Italy. The great number of rural festivals in the calendar testifies to its dominating influence. The interests of the Romans of all times were agricultural rather than commercial. Agriculture was the proper business of the senatorial class (§ 404). Writers of all periods looked back to the days when a Roman citizen-farmer tilled his own land with the help of a slave or two and when a dictator might be called from the plow. 431. Something has been said already (§ 272) of the varied climatic and geographic conditions of Italy and the possibility of varied production. There was deep alluvial soil in the valley of the Po. The volcanic ash that formed the plain of Latium gave a subsoil rich in potash and phosphate, but the surface soil was thin and easily exhausted. Great forests once grew on plains and hills that have been bare for centuries. Cutting the timber from the hills caused erosion and rendered much land unproductive. With the lack of forests on the hills to retain moisture the seasons in the lowland were affected. 432. An Ideal Farm. Cato discusses carefully the purchase of an estate (fundus). He thought that an ideal farm would lie at the foot of a hill facing south. It was important to choose a healthful locality and make sure of the water supply. The soil should be good, rich, not too heavy. The land should not be too nearly level, for that made drainage difficult. The farm should be in a prosperous neighborhood near a good market town, and on a good road if not near a river or the sea. Cato advised buying a farm in good condition and with good buildings. There should be a local supply of labor to be hired for the harvest or other times of extra work. He recommends a farm of 240 iūgera, about 160 acres, suitable for diversified farming. Pliny the Younger, when discussing land which joined his, says “The farms are productive, the soil rich, the water supply good; they include pastures, vineyards, and timberland that gives a small but regular return.” He speaks of the saving in equipment, supervision, and skilled service gained by the concentration of holdingsa good concrete instance of the rise of the great states (lātifundia) as small-scale farming became less profitable (§ 434). On the other hand, he says, to own much land in one neighborhood is to be exposed too much to the same climatic risks. 433. Small Farms. Evidence of farm life before 200 B.C. is chiefly traditional. The early farms were very small. We read of holdings of two iūgera (about an acre and a half). These seem too small for the support of a family unless they were accompanied with rights in community land. Holdings of seven iūgera (a little over five acres) are frequently mentioned, and were assigned when allotments were made of the public land in 393 B.C. Such a farm could be worked by the owner with a hired man or a slave or two. The houses were grouped together in villages, and the men went out to their work each day. Thus there was not the loneliness of farm life so often complained of in this country. With hand labor and simple tools the Romans did intensive farming indeed, or rather, gardening. 434. Various conditions led to the decrease in the number of small farms and the increase of the large estates (lātifundia). The devastation of Italy by Hannibal led to the ruin of many farmers and the abandonment of much land. The loss of life in that war brought a great decrease in free labor. The richer citizens bought large tracts of land or leased them from the government and worked them with slaves. The small farmer naturally found competition increasingly difficult (§ 129). And when the importation of grain made wheat-growing in Italy no longer profitable (§ 282), or when the exhaustion of the surface soil in Latium forced the small farmer to give up the struggle, the wealthy landowner could afford to plant his lands with vines or olives, or to turn large tracts into pasture, and wait for his investment to become profitable. However, in parts of Italy, particularly in the remote or hilly sections, small farms were worked at all periods. The lātifundia were regularly worked by slaves under a vīlicus (§ 145). Tenant farmers (colōnī) are rarely referred to during the Republic but become increasingly common later. Horace had five tenants on part of his Sabine farm; he worked the rest himself, through his vīlicus. Free labor on the farms did not entirely disappear, for we read that extra hands were hired at times. 435. Drainage and Fencing. The land was drained with care. Open ditches were used in heavy soils, covered ones in light. The covered drains were filled halfway with stones, gravel or brush, and then filled to the top with soil. Open furrows were left across the fields to drain into the ditches. Careful drainage produced thriving farms in sections that are now marshes where people cannot live or work on account of the malaria. On the other hand, most careful conservation of water and the building of aqueducts, dams, and cisterns made land productive in Africa where we now find ruins of Roman cities in wastes of sand. 436. Four kinds of fencing are described: hedges, fences of pickets interlaced with brush or of posts pierced with holes for the connecting rails, the “military fence” of ditch and bank, and walls of stone, burned or sun-dried brick, or concrete. Trees were often planted along roads, property lines, and fence rows, sometimes, of course, for windbreaks. 437. Plowing and Manuring. Cato said that the first and second rules of good farming were to plow well, and the third to manure well. Farmyard manure was stored in piles, old and new separately. Ancient writers advised that, where stock was not kept, the farmer should make such a compost heap as one does now for gardening, piling together leaves, weeds straw, and the like, with the ashes from burning hedge clippings and other rubbish that does not decay readily. The Romans understood green manuring, and though they had no knowledge of nitrogen-fixing bacteria, they did understand planting legumes and plowing them under, green. Without litmus paper they knew how to test soil for sourness. Bronze figure in the Museo di Villa Giulia, Rome. 438. Plows (arātra) were small and light. Some were of iron, some of wood. A wooden plow is still in use in Italy where the surface soil is thin and light and the ground stony. Some plows were straight, some curved. Heavy plowing was done with the straight plow. The field was plowed twice; the first time the plow was held straight, the second, sloping. The modern plow does the same work with one operation. 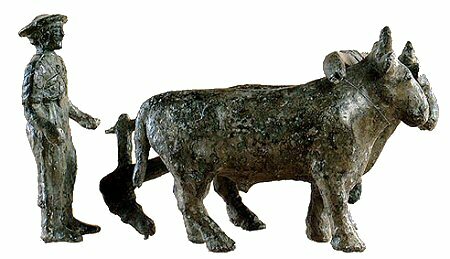 Oxen were used for plowing, and 120 Roman feet, the length that the oxen were supposed to plow without resting, was a traditional land measure. The plowing was done in close furrows, and the ground was stirred until it was as fine as dust. The mark of good plowing was to leave no sign of the plow. The ancient Romans thought that harrowing after sowing was an evidence of bad plowing. Pliny the Younger tells of land that had to be plowed nine times. 439. Calendar. The traditional knowledge of astronomy was important to the farmer, as a basis for the calendar of operations. The beginning and ending of the seasons was fixed by the positions of stars or constellations, and the heliacal rising and setting of certain stars indicated the seasons even to the day. This was the more important because of the confusion of the calendar before it was regulated by Caesar. 440. Farm Implements. Farm slaves (familia rūstica) have already been discussed (§§ 145-146), and something has been said of the work they were called upon to do. On the great estates skilled craftsmen of all sorts were kept. The smaller farmer might arrange to hire them, when needed, of his neighbor. Implements included different sorts of hoes and rakes, spades and forks. There were pruning knives, sickles, scythes, and similar implements. The plow has been mentioned already (§ 438), and there were primitive forms of the harrow. Where grapes or olives were grown, presses and storage jars were part of the permanent equipment. 441. Crops. The Roman farmer understood something of seed selection and practiced rotation of crops. He followed wheat with rye, barley, or oats. The second or fourth year beans or peas might be planted, sometimes to be plowed under green as stated above (§ 437), or alfalfa was put in. Alfalfa (mēdica) was well established in Italy before the beginning of our era; according to Pliny the Elder, it was brought from Greece, having come there from Asia. In other cases the land was left fallow every second or third year. Sometimes it was left fallow the year before wheat was planted. It was then plowed in the spring and summer as well as in the fall. 442. Cato lists farm crops in the order of their importance in his time. First he puts the vineyard, then the vegetable garden, willow copse, olive grove, meadow, grain fields, wood lot, orchard, and oak grove. It is to be noted that he puts grain in the sixth place (§ 282). The transportation problem was also a factor here, for, as moving grain overland was difficult and expensive, it was cheaper to import it from the provinces by sea. Vine-growing has been discussed in detail, as have the growing of the olive and processes pertaining to it (§§ 289-292, 293-298). 443. The vegetables grown by the Romans and their importance in the diet have been mentioned (§ 275). The farm garden contained the commonest of these for home consumption, with herbs for seasoning and for the home remedies (§ 414), bee plants, and garland flowers. These last were not for garlands at banquets, unless the farm lay near a town and they were grown for sale, but for garlands to deck the hearth in honor of the household gods on festival days (§ 492). Near the towns market-gardening was profitable, and vegetables, fruits, and flowers were grown. In early days a garden had lain behind each house, and the excavations at Pompeii show occasional traces of small gardens even behind large town houses (§§ 202, 208). 444. Wheat was sown in the fall (§ 282) and cultivated by hand with the hoe in the spring. At harvest time it was generally cut by hand. Sometimes the reapers cut close to the ground, and after the sheaves were piled in shocks cut off the heads for the threshing. Sometimes they cut the heads first and the standing straw later. There was a simple form of a header pushed by an ox, but this could be used only where the ground was level. Threshing was done by hand on the threshing floor, or the grain was trodden out by cattle, or beaten out by a simple machine. It was winnowed by hand, by the process of tossing it in baskets, or by shovels so that the chaff flew out or away. 445. Reeds and willows were planted in damp places. Willows were useful for baskets, ties for vines, and other farm purposes. The wood made a quick, hot fire in the kitchen. Vergil knew the willow as a hedge plant, whose early blossoms were loved by the bees. The word arbustum, translated by the word “orchard,” does not refer to an orchard as we understand the term, but to regular rows of trees, elm, poplar, fig, or mulberry, planted for the training of vines (§ 295), with grass, alfalfa, or vegetables between. Pigs were pastured in the oak groves to feed on the acorns. 446. Varro advised keeping stock and game on all farms. Oxen were used for plowing (§ 438), though that was slow work, but cattle-raising produced milk and cheese and beef (§§ 277, 281). Sheep were valuable for the wool, to be worked by the women, as well as for the milk and cheese and meat (§ 281). Where olives were grown, the sheep could be pastured on the grass in the groves. When the lowland pastures burned in the summer the flocks were driven to the hills. Goats were kept for the milk. The importance of pork has been mentioned (§ 278), but it must be remembered that the Roman in general ate less meat than we do (§ 273). Fowls were kept at the vīlla. Cato says that it is the business of the vīlica to see that there are eggs in plenty. In addition to the chickens, geese, ducks, and guinea fowl familiar to us now, pigeons, thrushes, peafowl, and other birds were often raised for market (§ 279). On some of the great estates game was bred in great variety (§ 279). Bees were kept, of course, for honey was used where we use sugar (§ 281). 447. Farmhouses. The ordinary farmhouse (vīlla rūstica) was built for use. It was not merely a house, but included the farm buildings gathered around a court (cohors) or courts, and was more or less regular in plan. Remains of a number have been discovered near Pompeii, and of others in various parts of the Roman world. They varied, of course, with the size and needs of the farm, its locality, and the taste and needs of the owner. Where the working farmer tilled his own land they must have been small and simple. On the large estates the vīlla included quarters for the master’s use when he came for inspection or rest. These might be in the second story. Cato recommends that the master’s quarters be comfortable, that he may spend the more time on the farm, and Columella adds that they should please the mistress. The room for the vīlicus must be near the gate, so that he could keep watch of comings and goings. There were quarters for the slaves (cellae familiae), and an ergastulum, partly underground and heavily barred, if there were any slaves worked in chains (§ 170). The kitchen was large and the slaves got their breakfast there in the morning and might gather there after work in the evening, if there were not the servants’ hall that Varro advises. Vitruvius says that the bath should be near the kitchen (§ 203); we find it so in some of the villas near Pompeii. The press-rooms and storage-rooms for the wine were supposed to face north, the rooms for the oil south. There were tool-rooms and wagon-sheds, and Varro’s remarks show that there were farmers then who had to be urged to keep their implements under cover. There were stables and a granary, and whatever else was needed for each particular farm. In the court there might be a pool, and if there were no spring or well there were cisterns. If the villa were suitably located on a main-traveled road, part of it was sometimes used for a wineshop or tavern. 448. Country Houses. It has been stated already (§ 145) that the country estates might be of two classes, countryseats for pleasure and farms for profit. In the first case the location of the house (vīlla urbāna, or pseudourbāna), the arrangement of the rooms and the courts, their number and decoration, would depend entirely upon the taste and means of the master. Remains of such houses in most varied styles and plans have been found in various parts of the Roman world, and accounts of others in more or less detail have come down to us in literature, particularly the descriptions of two of his villas given by Pliny the Younger. Some villas were set in the hills for coolness, and some near the water. 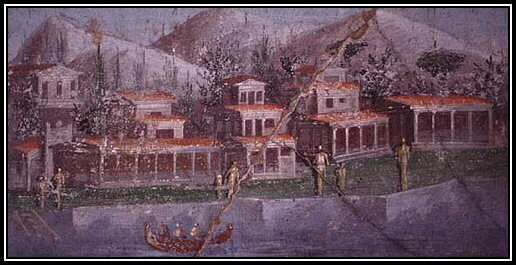 In the latter case rooms might be built overhanging the water, and at Baiae, the fashionable seaside resort, villas were actually built on piles so as to extend from the shore out over the sea. Cicero, who did not consider himself a rich man, had at least six villas in different localities. The number is less surprising when one remembers that there were nowhere the seaside or mountain hotels so common now, so that it was necessary to stay in a private house, one’s own or another’s, when one sought to escape from the city for change or rest. 449. Vitruvius says that in the country house the peristyle usually came next the front door. Next was the atrium, surrounded by colonnades opening on the palaestra and walks. Such houses were equipped with rooms of all sorts for all occasions and seasons, with baths, libraries, covered walks, gardens, everything that could make for convenience or pleasure. Rooms and colonnades for use in hot weather faced the north; those for winter were planned to catch the sun. Attractive views were taken into account in arranging the rooms and their windows. 450. Gardens. At the beginning of our era complaint of the extent of the pleasure grounds of the great estates and of the amount of land thus withdrawn from cultivation (§ 145) had become a literary commonplace. Gardens were an important part of these estates. They were architectural in character, that is, they were carefully laid out in straight lines or regular curves. The xystus was a parterre of trim flowerbeds in geometrical designs, edged with clipped box or rosemary. The favorite flowers were the rose (rosa)the cabbage rose, the damask, and a few otherslilies (līlia) and violets (violae), though violae seems to have included stocks, wallflowers, and perhaps sweet rocket as well. 451. There were the hippodromus for driving or riding, and the gestātiōnēs for walking or for an airing in the lectīca. The plane was a favorite shade tree (§ 295). Colonnades or clipped hedges provided shelter from sun or wind. Garden houses commanded favorite views and might include trīclīnia (§ 204). If the water supply permitted there were pools, fountains, and canals, and the terraced hillside gardens gave opportunity for effective use of water as it fell from level to level. Vines were trained on trellises or arbors (pergulae). Ivy was trained on trellises, walls, or trees by the topiārius, who had to be an expert in clipping the hedges of box, myrtle, or cypress and in trimming box into the symmetrical or fantastic shapes that we still call topiary work. 452. If these gardens afforded less color in summer, or less variety of flower and shrub in their season than ours do now, they were much more effective the year round from their careful design and use of evergreen foliage, water, statuary, and permanent architectural features. During the Renaissance the Roman garden was revived. 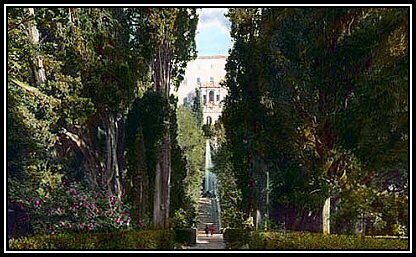 It may be studied now, much as the Romans themselves once knew it, in the gardens of the famous Italian villas which landscape gardeners and architects try to reproduce for us today. 453. Country Life. Little is known of the life of the small farmer. Ancient as well as modern poets have written charmingly idyllic pictures of the farm and the life upon it, where people still lived and worked as in the brave days of old. The farmer probably worked hard for seven days and went to town on the market days (nūndinae) to sell his produce, see his friends, and hear the news. His wife looked after the house and the family, supervising the slaves who did the actual work. The rural festivals added color to the farmer’s life, for the old religion kept its force longest in the country, even as it began there. 454. Literature tells us more of the landlord of the large estate. Cato lists the duties of the owner on arrival at the farm. After saluting his household gods, he is to go over the farm himself before calling for the vīlicus to make his report. After discussing this and giving further orders, he should go over the accounts and make plans for selling produce on hand and any superfluous stock (§ 159). Pliny the Younger laments the amount of time that has to be given to accounts and the affairs of his tenants, to the hindrance of his literary work. Though the busy city man fled to the country to escape the social duties of the city (§ 426) as well as to rest from his work there, there was no lack of social life among the villas, and the interruptions from this source were sometimes an annoyance too. Exercise, bath, and dinner formed part of the day’s routine, as in town. In addition to the exercise of the palaestra one might walk, ride, or drive over the estate. There were hunting and fishing, too, for the sporting landlord and his guests. The guests were numerous, because the lack of good inns made hospitality a constant duty (§ 388).